1. Floor mats. Volvo offers factory floor mats that fit your Volvo like a glove and perfectly match the interior color too. 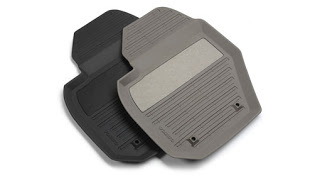 Volvo floor mats are available in carpet or rubber for all season wear. 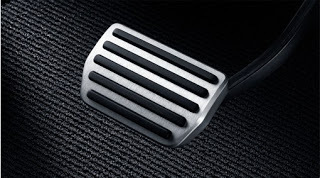 The really nice thing about genuine Volvo floor mats are the holes provided that lock your mats into a secure location and prevents them from movement and shifting which can cause a safety issue if the mat moves under brake or gas pedals. You should always use 1 mat at a time and do not stack up multiple sets which can be a safety hazard. 2. Cargo mats and Cargo trays. 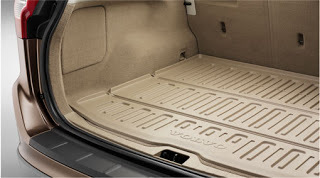 Volvo offers cargo mats and cargo trays in rubber, plastic and carpet which protect the cargo area from mud, water, dirt and damage. Volvo cargo mats and trays are a custom fit and match the interior color of your Volvo. Cargo trays contain water and dirt and can be cleaned easily with water after hauling messy loads. Volvo cargo mats are nice because they usually have a carpet side and a heavy duty rubber side which can be used for dirty loads yet remain luxurious and elegant carpet side up. 3. Load Bars. Volvo load bars (cross bars) allow you to quickly and easily add more cargo space by utilizing the roof area for loads. All Volvo load bar kits come with two bars hardware and instructions and some come with a keyed lock set. If your Volvo requires a t-track type load bar you may need to purchase a t-bar kit which consists of upside down t-bolts which slide in a track made into the top of the load bars. Keyed alike lock sets are available for all Volvo cargo racks which allows you to lock up everything yet one key fits every lock. To order a six lock set of keyed alike locks search part number 31330898 on our website. Locks will fit load bars and other racks. 4. Mud Flaps/Splash Guards. Volvo offers factory fit mud guards that are easy to install and fit like a factory accessory should. 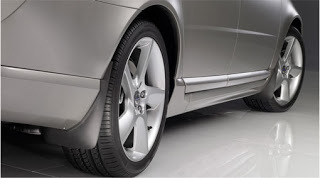 Volvo mud guards protect your Volvo from mud and rocks which can protect resale value and reduce wear and tear. Splash Guards come as a set of 2 and are available for front and rear applications. 5. Wheels. Volvo offers a lot of different wheels so that you can customize your Volvo and make it uniquely yours. 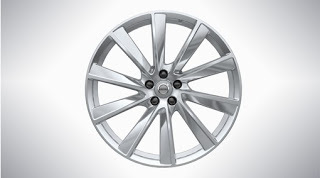 Add swagger to your Volvo with custom Volvo wheels. Wheel upgrades are available so you can increase the size of your wheels if desired and Volvo also offers smaller wheels for winter tire applications. 6. Volvo sport pedals are offered for most models and they add a sporty look and feel to enhance your driving pleasure. Volvo aluminum sport pedals are very easy to install and usually come as a set. 7. Volvo is always thinking of your safety and with that in mind they offer protective grilles that contain cargo items in the rear of the car which prevents them from coming flying missiles in the event of a crash. Simple items like a bag of groceries may seem harmless but if you have a crash at highway speeds or even less a can of corn can be the difference between life and death, walking away versus never walking again. Please take your safety and the safety of your passengers very seriously and protect both with a Volvo cargo grille. Volvo offers the cargo grille as a nylon net or a steel grille on most models. 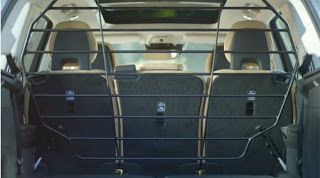 Cargo dividers are also great for pets as they contain fido in an area where he can do the least amount of damage and also offer him better protection in the event of a crash. 8. Volvo Bike Racks offer you a simple and inexpensive way to travel with your bicycles on the roof or trailer hitch area. 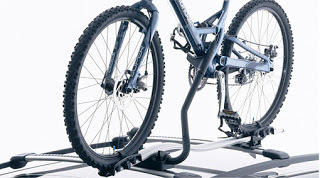 Volvo bike racks start at around $100.00 and are easy to install in minutes. You can use the keyed alike locks too so that the key fits the load bars and bike rack which makes it easy to lock and unlock. Many variations are available such as aluminum or steel, fork mount or wheel mount and multiple racks can be used at the same time. Volvo offers a bicycle rack with load assist too. 9. 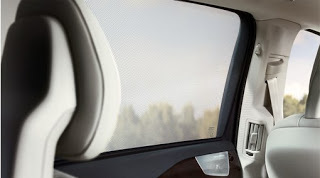 Volvo offers custom fit sunshades for the rear side door windows and cargo area glass. Volvo sunshades are very easy to install and most can be used at low speeds with window down. Volvo sunshades block out harmful sun UV rays that cause cause irritation due to vision or heat related concerns. Volvo sunshades also help to protect your Volvo from sun exposure and the damaging affects that the sun can cause such as premature wear and fading. 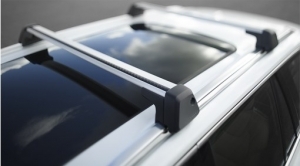 Volvo sunshades come in a 2-pack for rear doors or a 3-pc kit for cargo area glass. If you desire a front window sunshade volvowholesaleparts.com offers custom fit windshield sunshades in many variations. If you combine factory Volvo sunshades and the volvowholesaleparts windshield sunshade you will reduce the inside temperature of your parked Volvo by up to 50 degrees. Sunshades also reduce visibility of vehicle interior contents which can prevent theft. 10. 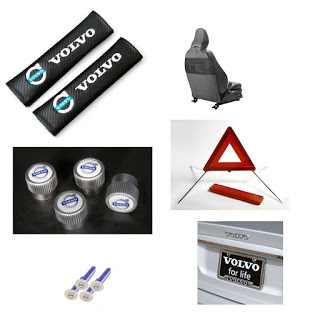 Universal Accessories are available from Volvo such as chrome license frames, Volvo logo tire valve stems and other safety and appearance related accessories. Add swagger to your Volvo and make it uniquely yours with Volvo universal accessories. Volvo also makes safety accessories such as roadside assistance products and child seats.